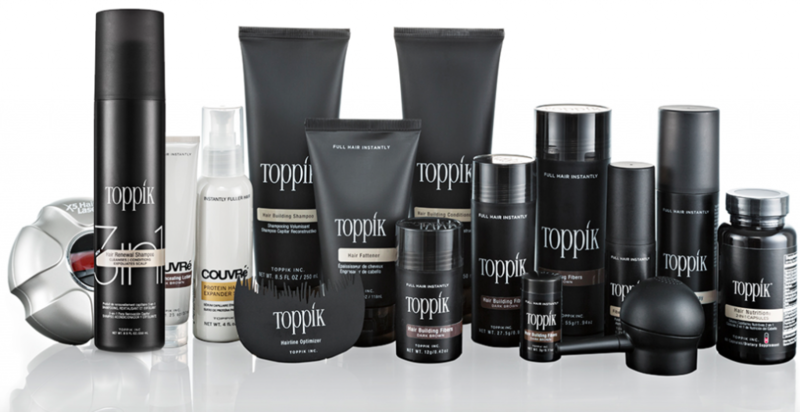 Home » Hairloss Restoration Both Sexes » Toppik » Toppik Reviews – Does Toppik Work? What Are the Hair Results? Only Here! Toppik Reviews – Does Toppik Work? What Are the Hair Results? Only Here! Toppik captivated my interest during my search for effective hair enhancement and/or revitalizing formulas. It is no more an uncommon fact that hair loss affects both men and women, irrespective of race or hair type. Similarly, the extent varies distinctively in both sexes owing to the variation in hormone production and secretion. 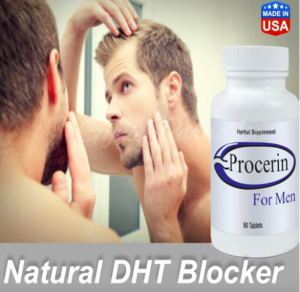 That reminds us about the contribution of DHT to hair loss. There are preventions and managements to this, but I strongly doubt if they are permanent. As I found the Toppik formulas, it is marked on its own official website and in other third party websites. While I scroll down more searching into the primary website, I noticed that the manufacturer of Toppik products have more details to share. Could these be fraudulent? Read review below for more details! 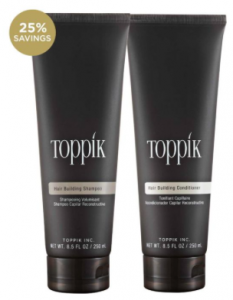 Toppik is known to be a brand with which hair thickening products are marketed. 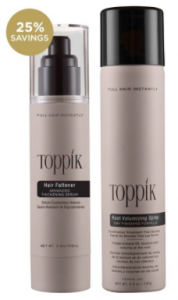 According to the manufacturer, Toppik range of hair enhancement formulas are a safe, natural and an undetectable way of improving the appearance of thinning hair without resorting to the use of drugs, chemicals or surgery in men and women. The popular formulas are not limited to Hair Building Fibers, Hair Building Conditioner, Hair Building Shampoo, Hairline Optimizer, Hair Perfecting Duo, Volume Boosting Set and Hair Fattener Advanced Thickening Serum. These are said to blend with existing hair strands to create the appearance of a naturally thicker, stronger and fuller hair. According to the manufacturer, the fibers give long lasting results as they are available in nine shades to match any hair color. The ingredients are Keratin, Ammonium Chloride, Silica, DMDM Hydantoin. May Contain/peut contenir/puede contener: Yellow 6 (CI 15985), Yellow 5 (CI 19140), Red 22 (CI 45380), Red 33 (CI 17200), Blue 1 (CI 42090), Green 5 (CI 61570), Green 3 (CI 42053), Green 6 (CI 61565), Orange 4 (CI 15510). The recommendation is that we apply the hair fibers in thinning areas and pat to disperse. This is another brand of Toppik hair enhancement formulas. 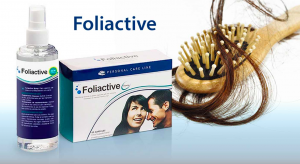 It is said to revitalize fine, thinning or damaged hair. According to the manufacturer, it is free from sulfates and paraben and should be used after using the shampoo for best results. Toppik Hair Building Conditioner should be applied to the hair ends, leaving it for 60 seconds before rinsing. It should be used with their Hair Fattener for best results. This is said to be the best thickening shampoo. What it should do is to clean and nourish the hair as well as the scalp. It should be used with the Hair Building Conditioner for best results. The recommendation is to apply it into wet hair, lather, massage the scalp before rinsing it out. According to the manufacturer, the Hairline Optimizer is designed to mimic a natural hairline when using Toppik Hair Fibers. 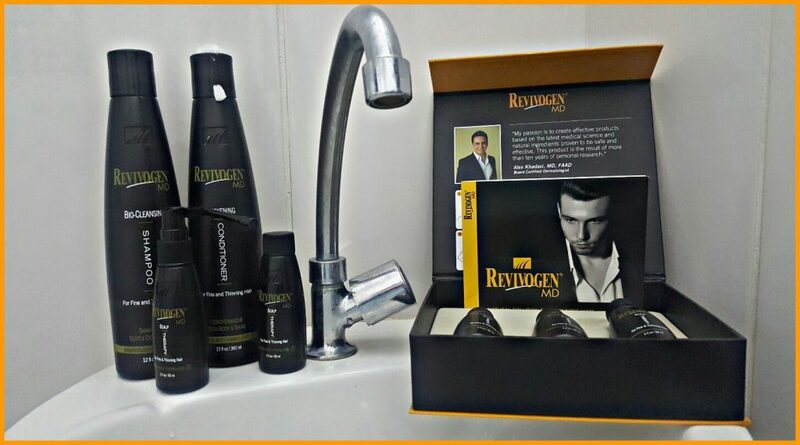 The manufacturer’s direction for use is to insert the Hairline Optimizer into the hairline, then spray the Hair Fibers around the hairline before patting the hair. The Toppik Spray Applicator should be used for best results. Makes Hair Look Soft and Natural. This is said to be for a flawless hair fiber application. It should create a fuller and thicker looking hair when used with the hair fibers. The usage instruction is on the manufacturer’s official website (www.Toppik.com/Hair-Perfecting-Duo). This is sold as a formula that volumizes and thickens the hair. According to the manufacturer, it incorporates a 3.4oz Hair Fattener bottle and a 5oz Root Volumizing Spray bottle. Makes the Hair Look Natural. This is marketed as a hair styling serum for fine or thin hair. In line with the manufacturer’s details, it should make the hair thicker and fuller. Hair Fattener Advanced Thickening Serum should contain Water (Eau/Aqua), Bis-PEG-18 Methyl Ether Dimethy Silane, Acetamide MEA, AMP-Acrylates/Allyl Methacrylate Copolymer, Tocopherol, Simmondsia Chinensis (Jojoba) Seed Oil, Triticum Vulgare (Wheat Germ) Oil, Keratin Amino Acids, Sorbitol, Sodium Hyaluronate, Acrylates/C10-30 Alkyl Acrylate Crosspolymer, Propylene Glycol, PEG-40 Hydrogenated Castor Oil, Oleth-20, Methyl Gluceth-20, Phenoxyethanol, Caprylyl Glycol, Methylchloroisothiazolinone, Methylisothiazolinone, Fragrance, Yellow 5 Red 33, Blue 1No. Toppik manufacturer, from my findings should offer refunds to unsatisfied users of their products. 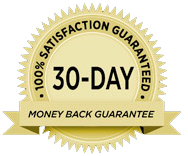 That is, if I am in this group of people who want to eliminate their hair thinning naturally, I can test the products for 30 days and request for a refund if am not thrilled with the result. Toppik states to offer free shipping and international shipping for all purchased orders. There is a section on the company’s official website where questions were asked and answered about hair enhancement as well as the products. Users can contact the manufacturer through the channels provided in the products’ official website. Now that we have seen significant details about Toppik hair products, can we now say that they are effective for eliminating hair thinning? It is pertinent we do this in line with the details obtained so far. 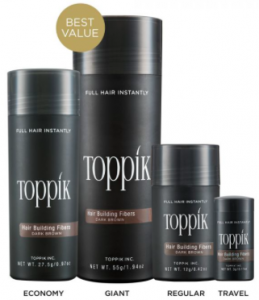 According to the manufacturer, their Toppik formulas provide a lasting solution to hair thinning. The manufacturer offers some encouraging support, but I could not find any clinical or scientific proof that supports the product claims. They do have mixed reviews on some third party websites. Evidently, I could find videos showing users before and how the looks like after using these hair enhancement formulas. At this point, I can say that Toppik products could be effective in combating hair thinning. However, users will have to continue the use of the products as directed to maintain the results achieved. You can visit the products’ official website at (www.Toppik.com) and get what best fits you. Don’t forget to leave your comments in line with your experiences! Previous Post Hair Again Review – Does Hair Again Supplement Really Work? Go Through This Review to Find Out! Next Post Hair Grow Secrets Review – Does This Really Work or Is It a Scam? Find Out Here!